Better Than Never: are you a warrior? The pride that comes along with being a Warrior. Steel warrior helmet age division prizes. The craziest frickin’ day of your life. Why do we get warrior helmets? 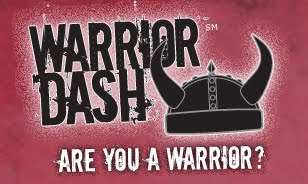 How do I train for Warrior Dash? Day one: run as far as you can. Go home. Day two: do the same thing. Find the dirtiest pond in your neighborhood and snorkel in it - in your slippers, without goggles. Practice your climbing and crawling skills at your local jungle gym. Ignore the small children and parental glares. Do not shower or shave for weeks in order to obtain a true Warrior look. Seriously though, your best bet is to do plenty of running leading up to the race. I'm pretty pumped! The race isn't until May 2nd, but I'm posting it here in case any other Texans want to get in on this action. Slots are filling up fast - they had to add a second day to the event, and we made it into the 9:30am wave on Sunday.